The open layout allows for big groups to use the booth at once, easily! 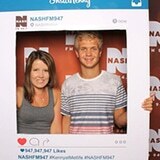 The photobooths look great, fit in any venue, and attract attention as people begin to use them. The open layout allows for big groups to use the booth at once, easily! The photobooths look great, are flexible to fit in any venue, and attract attention as people begin to use them. Some guests will love just watching the action all night! You can choose from our numerous premium backdrops with unique colors and patterns, our one of a kind “shadowless white”, our Green Screens (and than any digital photo will be the backdrop) or finally a custom made Step & Repeat for the Hollywood feel. Booths and GIFS are a hot trend right now and for good reason. They provide so much entertainment and interaction for your guests…whether they are using it or just watching. We have a modern open layout with engaging attendants that you ‘experience’ and become a part of. Everyone will leave with print in hand, and every amazing photo taken that night will be saved online. People will RAVE about the booth…trust us, they always do (see the testimonials for proof!). 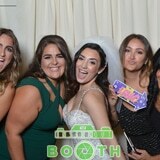 Our open air photo booth is hands down the best in the New Jersey and New York surrounding area. We focus solely on premium photo booths and photo entertainment… step and repeats, digital green screens and all the latest add-ons (scrap books, social media, live slideshows, video booths, polaroid guests books). We have the highest quality DSLR camera, instant printer and studio lights in the industry and thus we get the best photos! Our set-up is classy and luxurious looking, far from the cheesy cramped booths you see at a mall! Be careful, your DJ or other companies may try to rent you this! Any party or event looking for a photo entertainment should reach out, we love to chat about our booths! Our booth rentals been a major hit at weddings, engagement parties, proms, corporate events, sponsored parties, bar mitzvahs and bat mitzvahs, quinceañeras, birthdays (from 1 years old to 100, we’ve done both! ), showers, holiday parties, graduations, social gatherings, trade shows and conferences, launch parties and many more! We’ve had clients rent a photo booth in the Tri-state (and now CT) over 5000 times since 2012, and every one was a success! We look forward to doing even more rentals in 2019. Grab some friends and family, slap on a mustache, strike a funny pose, and SMILE! Contact us at 201-497-0703, our contact form or meet up with us in New Jersey or New York City and now our Connecticut Office! Professional Studio lighting and high end DSLR cameras. The latest touch screens, backdrops and Dye-Sub printers. Beautiful 4×6 prints made right on-the-spot. These high gloss prints are yours in seconds – literally 6 seconds. Take as many pics as you want – they are all saved in your own online gallery for FREE and easier shared! We make the entire process super easy. From our custom service and speed to our setting up early and rock star photographers. Experience- Over 5000 successful events and counting! Reputation- Over 900 5 star reviews and ratings across all platforms. Customization– We’ll customize the prints, booth, props, backdrops, attire etc just for YOU. Customer Service- We answer any questions you have, and FAST. So many clients always comment how it was pleasure to work with us and our speed is unmatched from any vendors. Ask us anything (call, email, text, stop-by) and we’ll bend over backwards to help. Dedicated Pro’s – DJ companies and photographers sometimes have a photo booth rental and the deal looks to god to be true. It’s often because to them, it’s just an Add-on. It could be an outdated booth, older equip, and they just won’t give your photo’s the quality and care we will. We do this FULL TIME in NJ, NYC and CT.
Pricing- Finally, we have packages to fit almost all budgets. Even our high end packages still beat other “high end” and “GIF” and “Boomerang” booths in the area…while we do even better quality! We keep pricing fair, put tons of work into every event to impress you and do volume – that’s our model.